Saskia Angenent | University of York Aug 10, 2016. Drones will be used to discover more about the social lives of killer whales as part of new research which could help protect the species. Experts from the Universities of York, Exeter and the Center for Whale Research in Washington State, USA, believe drone footage could revolutionise our understanding of whale behaviour. Researchers have so far analysed hundreds of hours of video of killer whale family groups, observing their relationships during fleeting glimpses as the whales surface for breath. They found female killer whales who survive after menopause pass on crucial information which helps their family members to find food during hard times. Only humans and some whales continue to live for many years after giving birth to their last offspring. Such research provides possible insights into the reasons behind this, and is the subject of a new BBC Radio 4 documentary. The research team, funded by the Natural Environment Research Council, has so far focused on the vital social roles post-menopausal matriarchs have in the social killer whale community. Now, researchers want to collect new data about how whales interact. 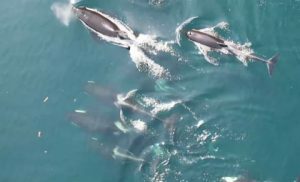 Using drones will give them a birds-eye view of social behaviour, allowing them to see how whales support each other, and which whales in a group share food, intervene during conflict and babysit. This information will allow experts to understand which social behaviour helps whale reproductive success, to make more accurate predictions for their health and survival. They hope the public will support their work through a crowdfunding campaign launched by the University of Exeter this week.